Radio Dust attempts to follow parallel stories a portrait of the small Project space in the heart of Tehran and an ongoing project called Dustopedia, a collectively-curated encyclopedia. Along the way Bahar Ahmadifard takes us by the hand and will explain how she gets acquainted with the small institution, how she as a writer and photography critique got herself familiar with the Parking Video Archive and Moving Dust, a traveling video program touring in different cities Tehran, Shiraz, Kerman, Bandar Abbas, and Isfahan, while hearing fragments of the soundtracks of the films and videos in the program. Besides we enjoy listening to various sound artists and musicians who collaborated with us in the past years. Carefully selected works by Ali Farzadi (Isfahan), Leonie Roessler(The Hague), Rahi Sinaki (Tehran/Vienna) and Kasra Pashaei (Tehran), who were invited to contribute to the podcast. This marks the start of a new chapter for Dustopedia. On Radio Dust, we also listen to readings of a text by Nebras Hoveizavi on Dust in Mysticism, commissioned by Obieg Magazine – Poland. Radio Dust is featuring Fragments of soundtracks from The Moving Dust, video programs by Jaleh Nessari, Arash Khosronejad, Anahita Hekmat, Nazgol Emami, Minou Iranpour, Amirali Mohebbinejad, and Aria Farajnejad. Additional sound materials and field recordings were provided by Nebras Hoveizavi and Amirali Ghasemi. Radio Dust is Edited by Amirali Ghasemi with special thanks to Raha Faridi for the kind feedback and the support. Amirali Mohebbi Nejad (b. 1981, Iranian) is a Tehran-based video artist, singer/songwriter, and photographer. His artistic journey has started with photography and music since 2001, followed experimentations in video and installation. He enthusiastically pursues his video practice ever since he made his first video back in 2006. His videos have been shown on several occasions across the globe to name a few: “Invisible Present Tense” in Brazil, Canada and the United States, “Part of Me” in Paris and Tehran, and “If we ever meet again” at Thoman Erben Gallery, New York. In the field of music, he initiated the founding of several underground bands; and meanwhile continued his solo project as a singer/songwriter. In recent years he has been working individually as a freelance artist in the Iranian music scene. His first album was released in early 2016. Nowadays, besides his solo activities, he is participating in several musical projects, collaborations. His works are mostly inspired by his personal concerns and reflects his view of the world surrounding him. Mohebbinejad uses sound/visual collages and sound recording and carefully mixes them to create his multi-layer- audiovisual-scapes. 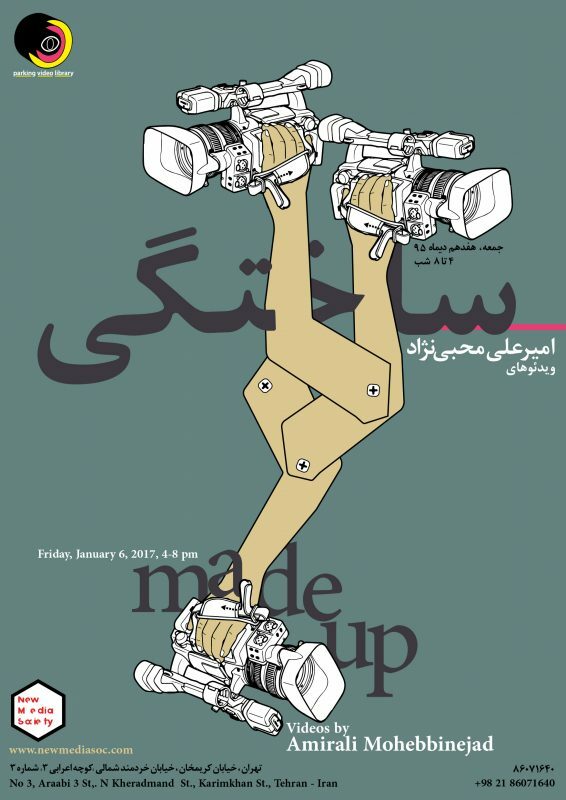 New Media project is proud to host MADE UP, a one-day open studio with Amirali Mohebbinejad to mark his ten years of video making.